This season is all about classic, romantic hairstyles. These two are beautiful options for your wedding or prom or any other formal event you may go to this Spring. Brought to you by Butterfly Studio Salon in NYC, stylist Vanessa Fernandez credits her "experiences in the fields of fashion and beauty to have helped contribute to her sought-after eclectic and gorgeous way of styling hair." Will you be wearing one of these hairstyles this Spring? -After shampooing hair, apply texture cream such as Tesai cream to towel dried hair. -Allow hair to almost completely air dry or diffuse with a blow dryer and when the hair is 95% dry, shake it out and wrap random sections vertically around a 1 inch curling iron away from the face. -Hold the curling iron vertically and wrap the hair around without letting the iron close. -Grab 2-3 sections from each side of the desired part from both the front and the back, intertwining each section until you reach the back of head. -Secure with a pin and repeat on other side. -In order to achieve this look, the hair should be air-dried so the natural texture of the hair can be used. -Section off the hair from ear to ear so that the bottom half can be wrapped into a loose ponytail close to the nape. -Taking the remainder of the hair on top , use a hair spray such as the Shu Uemura Iron Design, for hold and wrap large vertical sections around a 1 inch curling iron. -Make sure all sections are moving away from the head. 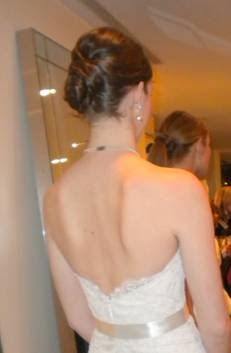 -Pin random sections around the ponytail, intertwining them into a loose bun shape. Those wedding hairstyles are lovely. I wish i was getting married already. I also love ur blog and i'll be sure to follow.